Size: 6.5" x 3.1" x 0.65"
Citizen Systems Japan Co., Ltd. introduced in 2008 with the SR-270X a pretty close clone of the Casio fx-300ES but the calculator seems to be available only in the European market. In the United States an identical product is sold by Office Depot as Ativa AT-30SX. • The menue structure, display size and character fonts are identical with the Casio fx-300ES and Citizen SR-270X. • The keyboard functionality is identical with the SR-270X but the layout of the keys extremely improved. • The embedded calculator algorithm reveal the same precision as the SR-270X but report in most cases two digits less in the display. • Holding down the cursor keys results in a fast moving cursor while the SR-270X supports just single-steps. 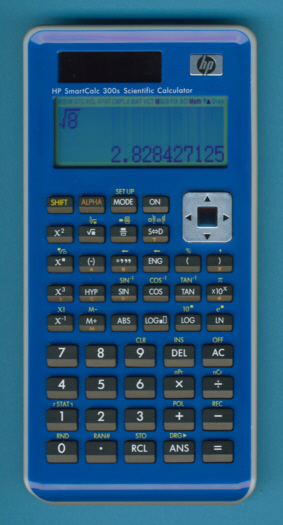 The HP SmartCalc 300s, Ativa AT-30SX and Casio fx-300ES sport a dual power system with solar cells and battery but the HP and Ativa calculators don’t turn on without batteries, even in bright sunlight! Dismantling the Hewlett Packard SmartCalc 300s is different from most other calculators. The battery cover extends over 80% of the calculator surface and allows access to two screws. The remaining 2 screws are hidden under two rubber feet. Inside we located a pretty common construction with a single printed circuit board (PCB). The PCB hides the single-chip calculating circuit under a small protection blob of black epoxy and drives the graphing display with a heat sealed fine-pitch connector. Please compare the Hewlett Packard SmartCalc 300s with its competitors Casio fx-300ES, Sharp EL-W535B and Texas Instruments TI-30XS MultiView and understand that it is 99% compatible with Casio fx-300ES! Don't miss the related HP Quick Calc introduced already in June 2008 and the HP 30b Business Professional introduced in 2010.